I have a Dell XPS 9550. This was shipped without a TPM. 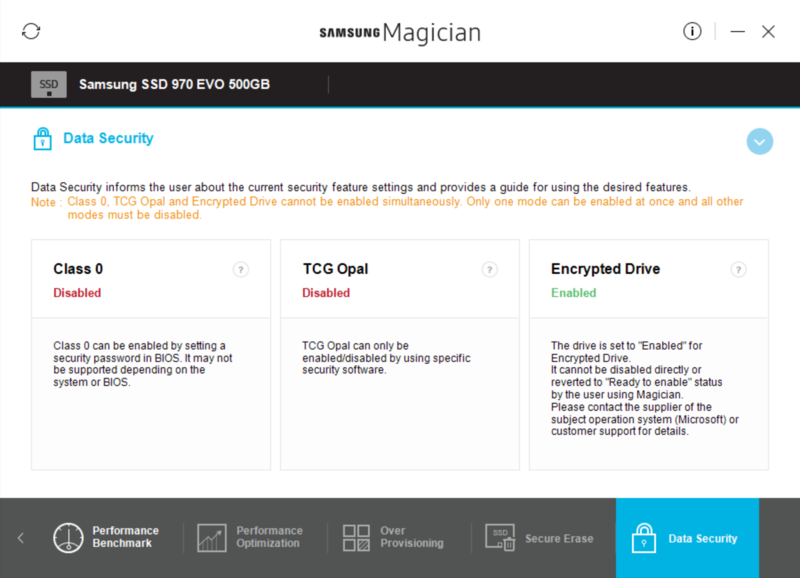 I have since installed a Samsung 970 EVO SSD which as I understand is a self-encrypting drive (SED) and, what I am not sure about is, it can be encrypted without a TPM? So, I have installed the drive, installed Windows 10, set "Encrypted Drive" to "ready to enable". Did a secure erase and reinstalled Windows 10. Bit Locker will not enable on the OS drive without overriding the "your administrator must set the allow bitlocker without a compatible tpm" setting. Does this mean my drive is encrypted? Or do I need to override the TPM setting and setup bit locker still and then bit locker with use the hardware encryption on the drive? Or do I need to set a BIOS system password? I have searched but with no clear guidance or insight. There's a lot of information here so I'll try to answer directly and clear up anything that's incorrect. First and foremost, BitLocker drive encryption and the built-in encryption on the SED are two mutually exclusive forms of encryption and I would not recommend running both due the likely significant performance impact. If you are using the built-in drive encryption (and it appears you are), then there's no need to use BitLocker. The SED stores the key on the drive controller (hardware outside of the OS) so it's faster and technically more secure without a TPM (although there are publicly known attacks against SEDs from Samsung and Seagate (and BitLocker for that matter)). Well, yes. But what you're confusing is BitLocker with the built-in drive encryption on the SSD. As previously stated, they are two distinct forms of drive encryption. You are receiving the message, "your administrator must set the allow bitlocker without a compatible tpm" because you don't have a TPM and by default, BitLocker wants to store the key in the TPM for the additional security measure. If you change this setting, you can still use BitLocker but the key is stored on the drive and can be stolen/reclaimed by someone with the right tools and know-how. I'd also like to reiterate, dont' use both the SED encryption and BitLocker. It's redudnant and will likely destroy your IO experience. If you want to use BitLocker over the SED built-in encryption, you'll need to remove the encryption which will wipe the drive, reinstall your OS without the built-in encryption and then enable BitLocker without TPM. If you allow your laptop to boot to every capable bootable device technology on the laptop, the BIOS password is functionally irrelevant as they'll just boot off of CD or USB to another OS, mount your drive, unencrypt it, and get your info. <-- this isn't trivial, but certainly far from unlikely. If someone has physical access to your laptop, they can perform the J38/39 jumper reset to unset the BIOS password (this still works, I did it about 3 months ago on a brand new Dell). Edit: As stated in the comments, if you enable BitLocker, it can and will prefer to use the hardware encryption enabled by the SED due to performance reasons. However, as it's not yet enabled and your Samsung software is saying the drive is encrypted, it's probably using the built-in method on the SED. Not the answer you're looking for? Browse other questions tagged bitlocker ssd or ask your own question.